I apologize for my lapse in posting as of late. For the moment I’ll blame it on my recent poor health and the fact that I am just plain tired of writing. All day every day, I sit here staring at my dissertation, which stares back at me from the computer screen. What I want to say is on the tip of my tongue, but I can’t come up with a way to write it down. It tends to leave me too burned out blog, but I’ll try to do better, I promise. 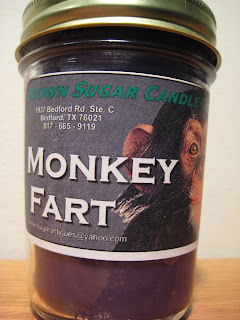 When I first opened up the candle, I must admit that I was hesitant to smell it. Much to my surprise though, it actually smelled quite nice. 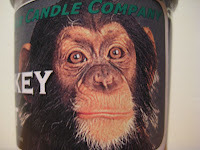 The problem lies in the fact that the label clearly says "monkey" and the photograph is clearly of a chimpanzee. I have half a mind to write the company and respectfully point out their error. Perhaps also mentioning that even 6th graders know the difference between a monkey and an ape. The jury is still out as to whether college students can get it right. Thanks for the great gift, Andy and Kim! You need to fill them in! Good luck on the disseration!